The Sierras and heavily forested areas of California are experiencing it even worse, with an estimate 129 Million dead pines across the state! Before we jump to what we can do about it, let's dig a little deeper into each. When trees experience stress, their defenses are compromised, and they become more susceptible to pest and disease. There are many forms of stress a tree can experience in an urban environment -- soil compaction, pollution, drainage issues, root removal, competition with turf -- but in hot summer months, the most impactful stressful element is often from drought. Drought stressed trees may show symptoms of dieback and yellowing of their needles. The lack of water can also affect soil chemical, physical, and biological activities that are essential for plant and soil health. Thus, both water and soil management are crucial to the trees survival. The fungal spores are spread easily by wind, rain, or carried by insects and beetles. Once a tree is infected, the fungus is generally isolated to each canker or lesion. The infections can then cause girdling, which blocks water and nutrient flow through the tree. This results in needle dieback and canopy defoliation. The oozing you see is the resin (or pitch) that builds up at the site of the infection. The resin production is the tree's effective defense mechanism against insects and pathogens. Some studies also suggest that the fungus is able to grow inside resin ducts and actually stimulate even more resin production. Regular fungicide treatments can effectively control Pine Pitch to reduce symptoms. Bark beetles are opportunistic pests and go after trees too weak to defend themselves. They take advantage of pines weakened through stress and/or disease and wreak havoc. Often, they are the so-called "final nail in the coffin". If the Pine Pitch Canker is left untreated and doesn't kill the pine, it is likely the bark beetles will come in and finish the job. The bark beetles we see in the urban landscape that most commonly attack our pines are: Engraver Beetles (Ips emarginatus, Ips mexicanus, Ipsparaconfusus, Ips pini, Ips plastographus) and the Red turpentine beetle (Dendroctonus valens). Ips (engraver) beetles will attack from the top down. They enter into the younger, tender tissue at the top of the trees and you will usually see the top dying first. Red Turpentine Beetles attack on the lower 6 ft of the trunk and you can easily spot their attack sites at the base of the pine. An indication of beetle infestation is visible by pitch tubes along the trunk. As the beetle bores into the tree, healthy trees can often fight back by forcing pitch out of the hole and pushing the beetle back out. (If you want to see a really cool video of this in action, watch it here.) Trees that are compromised by lack of water, or drought stress, may produce little to no sap at all, thus cannot fight back. Instead, you may find piles of what looks like sawdust around the hole and at the base of the tree, called frass. Whether the tree is defending itself or not, unfortunately, little can be done to stop an infestation once the beetles have taken over the tree. Thus, preventative measures are the best practice. The proper care and management practices that your pines receive can have a significant impact on its survival during drought periods and seasons when beetle populations are on the rise. The most effective way to prevent pine death by beetle attack is to maintain tree vigor through adequate watering and good soil management, and to regularly treat Pitch Canker infected pines to suppress fungal activity. 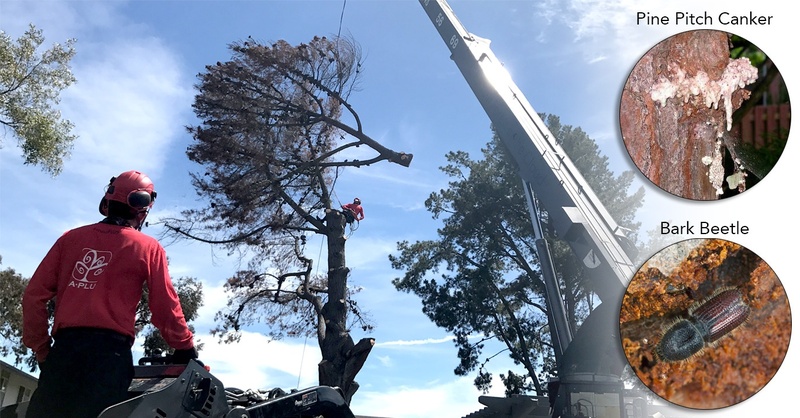 If you don't know what trees you have, if your pines are "At Risk" or even if your pines may already have some of these issues, then don't hesitate to call us out to you! We will provide a free assessment and inventory of your trees. Click on the link below to request a visit and one of our Urban Forest Managers will drop in!